Eastern Mediterranean University Rector Necdet Osam PhD visited Rector Prof. Erol Özvar PhD. 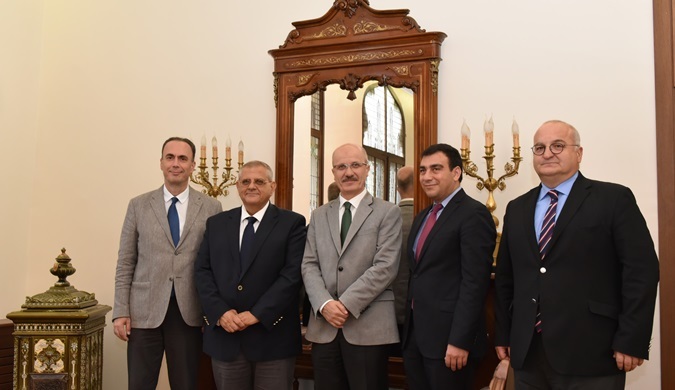 The visit was held on September 7,2018 at Sultanahmet Rector's Building. Opening Ceremony of İŞKUR Plus Service Point was held in cooperation with Marmara University and İŞKUR. The event started with a seminar held in Ibrahim Uzumcu Conference Hall on April 17, and ended with the ribbon cutting of the new ISKUR Service Point located on Goztepe Campus. Volunteer student training seminar was given within the scope of Zero Waste Project. Our university is one of the 3 universities that have signed a protocol with the Ministry of Environment and Urbanization that will carry out the project with the participation of volunteer students. Istanbul Flute Ensemble, including the students and academicians of Marmara University, performed 3 concerts in important halls in Europe. The opening of the Multiple Intelligence Laboratory, which was established with the support of the Basic Education Department of Atatürk Education Faculty, took place on Wednesday, 17th April, at Bakırköy Ataköy Medeni Berk Primary School. Paper Out Exhibition opened on April 16, 2019 at Galerie Mezi Oknem a Dveřmi in the Art and Design Faculty of Jan Evangelista Purkyne University in Ústí nad Labem, Czech Republic. Professor Messoud Efendiev at the Institute of Helmholtz Zentrum München was a guest at Marmara University Faculty of Arts and Sciences on Tuesday, April 16th. “Turkishness Science Seminars -2”, organized by Turkish Philology , was held in the Faculty of Arts and Sciences on Tuesday, April 16, 2019, with the presentation of Prof.Dr. Emine Gürsoy Naskali titled “ On the Studies for Turkish Name Science”. “1st Technicians Meeting”, organized by Marmara University Vocational School of Technical Sciences, was held in the Conference Hall of the Faculty of Technology, Goztepe Campus, on April 16, 2019. School of Applied Sciences, Department of Jewelry Design, organized a workshop in partnership with Grafiek en Tekenkunst (Graphic and Drawing Arts) Luca School of Arts Ghent (Belgium).